The beauty/makeup world has been united in grief over the news of Talia Joy on Tuesday. The lovely Nicole of Nail Polish Wars had the great idea of beauty bloggers paying tribute to Talia by doing a mint mani. Why mint? Because it was the shade Talia wore in her last Instagram update. Those of you who have been following my blog for a while must be aware of the recent cancer diagnosis my beloved Gramps has received. He is at stage I and fully curable, but this news and the treatment process aren't pleasant at all. I can't even begin to imagine how terrifying it must have been for Talia and her family to hear the bad news each time after a while in remission and of the metastasis and to go through the aggressive treatment over years. I have been following Talia's videos for a while now and am incredibly touched by her bravery and optimism. Here is my tribute to Talia. I wanted to do O.P.I. and China Glaze because Talia said she loves these brands best. The first one is China Glaze Duplicity from the Tranzitions collection - where the polish changes colour on adding a top coat. The formula wasn't as good as O.P.I; I needed two coats for opacity and there was some streaking. And the brush had a fray. I first thought I would try with Bourjois So Matt as the topcoat and dotted it over. Nothing happened to the colour after a decent waiting period so I dotted Rimmel Pro Super Wear over those dots. It turned a lot bluer - tealish blue. The downside is, because top coat is invisible, you can't see where you've already applied the dots. The second mani is O.P.I. Thanks A Windmillion. It is a dusty creme mint with blue undertones. I've applied just the one coat. The formula is a dream and the opacity is amazing. For some reason, I then had the insane idea of drawing smiley faces, temporarily forgetting that free hand and I never work. If Talia sees this, it will make her smile, so that's all that matters. 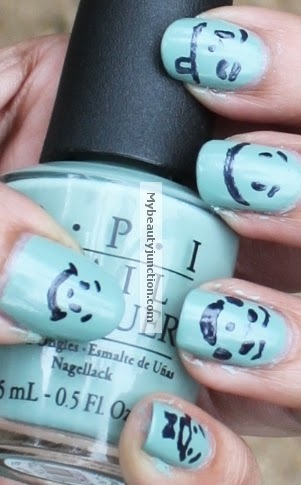 To post your own mint mani today on your blog, please grab the code from here. Please use the hashtags #mintmanisfortaliajoy and #taliaslegacy while sharing your mani and/or this post on Twitter, Facebook and so on.